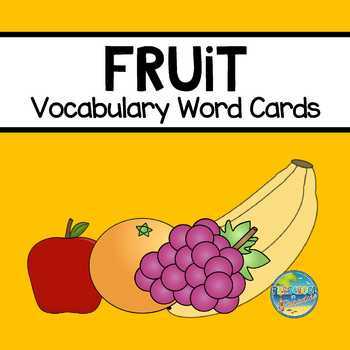 Fruit Vocabulary Word Cards provide 15 picture cues of colorful fruit coupled with the printed vocabulary word for the associated picture. Days of the Week cards are also provided. 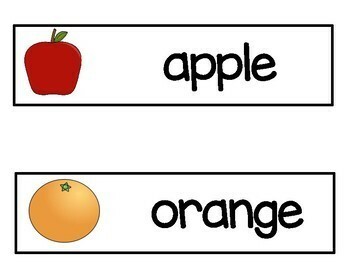 * to assist students when labeling their drawings. .
apple (red), orange, bananas, blueberry, cherries, grapes, lemon, lime, pineapple, strawberry, apricot, apple (green) , watermelon, kiwi, and pumpkin. 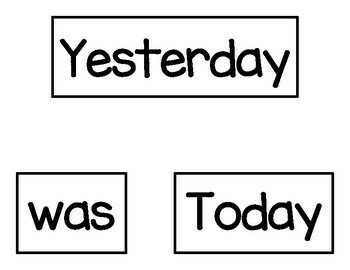 Days of Week Cards and Word Cards are provided to create Pocket Chart sentences. 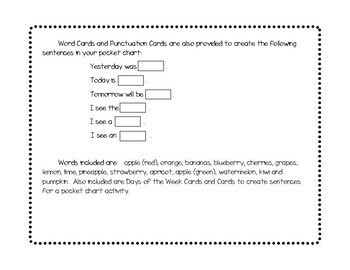 Fruit Vocabulary Words would definitely be a great supplement to your food unit, to increase students' vocabulary or to use for color identification within the natural environment!